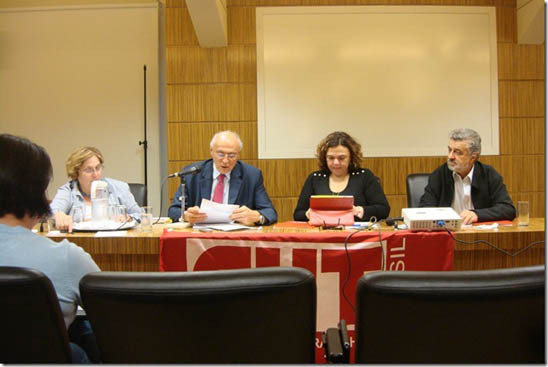 Last Friday (May 4, 2012), a seminar entitled National Conference on Occupational Asbestos Disease and Death and a Brazilian Asbestos Ban was held in São Paulo, Brazil. This well-attended event was organized by the Central única dos Trabalhadores (Central Union of Workers/CUT), the largest trade union in Brazil with a membership of 7.46 million. The agenda of the one-day meeting revealed the broad-based support which now exists in Brazil for a national ban as it included eminent experts from the trade union movement, the labor inspectorate, members of federal and state parliaments, the medical and legal professions and social movements including ABREA, the national association representing asbestos victims. From left: Fernanda Giannasi, Senator Eduardo Suplicy, Junéai Martins Batista, Health Secretary of CUT, State Deputy Marcos Martins. During the CUT ban asbestos meeting, São Paulo State Deputy Marco Martins, author of the São Paulo bill to ban asbestos, and Federal Senator Eduardo Suplicy, author of a draft federal asbestos ban bill, supported CUT's call for Supreme Court action on the asbestos scandal reaffirming the constitutionality of Brazilian citizens to live a life free of asbestos. Labor Inspector and veteran campaigner for a Brazilian asbestos ban Fernanda Giannasi endorsed these calls on behalf of all the country's asbestos victims.